Adding a deck to your home can seem like a lot of work, but it is actually very affordable, and the long term benefits greatly outweigh the initial investment. When you think that it’s time to add a deck to your home, be sure to hire a professional handyman/deck builder to help with planning and the build. There are so many options of materials for decks available, from different types of soft wood, to composite materials that are resistant to scratches and stains. There are different styles, layouts and railings. Building a deck is very exciting and the planning process can be fun. Here are a few of the key points and benefits of adding a deck to your home. Have you been thinking about adding a deck to your home, but not sure if the benefits are worth the investment? Adding a deck onto your home can breathe some new life into your home, and your back yard. Some of the benefits of a deck may surprise you! First things first, one of the best benefits of adding a deck to your home is that it will increase the value of your property. A deck will increase your home’s value more than adding a living room or an extra bathroom! I would have never have guessed that! If there is one home remodeling project that you can count on adding value to the home, it’s a deck. According to the National Association of Realtors, homes with decks sell faster and the homeowner can count on recouping between 71 percent and 105 percent of the cost of a new deck build when they sell their home. That’s a pretty sound investment! The addition of a finely built deck provides great aesthetic appeal for your home. 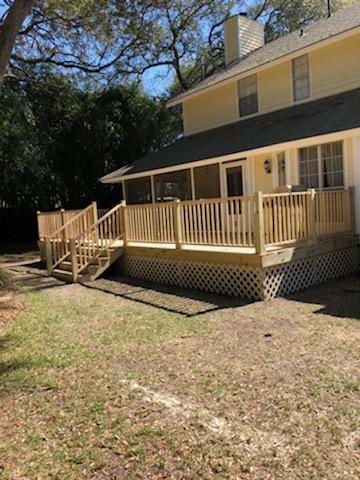 Decks are easy to paint or stain in order to match the colors of your home and a deck built away from the home can help highlight an area of a yard or garden that may otherwise go unnoticed. Add lighting to your outdoor living room for a beautiful evening and add a nice patio set furniture for more comfort and appeal. In climates that are warm year round, your deck can be a place where your family eats, relaxes, even exercises. There is always the option to enclose it into a four season’s room or a sun-room later on, as doing so will also increase the value of your home. Adding a deck creates a new space for your patio set, plants, and/or your barbecue. The extra space could also be used for a container garden! Decks are a great place for potted plants, hummingbird or squirrel feeders, that may not have a place elsewhere in your home. An outdoor deck creates a whole new living space for the family. It can add hundreds of square feet to your home, provide both uncovered and covered outdoor living. Depending on the style and size of your new addition, you can even add an outdoor kitchen area with running water, seating space, a jacuzzi, sauna, and fire-pit. I can’t think of anyone who doesn’t enjoy homemade backyard smores! To add even more space, creating a multi-level decks allows homeowners an easy and fun way to enjoy the outdoors even when they don’t have a lot of yard space. Another significant advantage to building a two-story deck is that it doubles your outdoor living space if you use the area beneath the deck. Not only can you enjoy the top level of the deck but the lower deck is also an outdoor extension of your home. If you are looking to add more living space to your home, building a new outdoor living space seems like a no-brainer. We added a screened-in wood deck to a friends home a few years ago, and it is their second living space! They are an animal loving family, so the perfect choice for them was a screened in addition to the deck which gives the fur kids an “outdoor” living space where they are safe from the outdoor kritters, but they have all the advantages of being outside, and getting fresh air. Many families use their deck daily, so that alone can be worth the investment. Of course, the absolute best thing about a deck is it provides a great place to host parties, have family over, or simply enjoy your morning juice or coffee. Nothing is better than the sun shining down while friends and family gather around. They are absolutely wonderful for having summer time birthday parties and backyard barbecues! If you have teenagers, it can make your home THE place to be. There is just something about sitting out on a patio deck…whether it’s to soak up some sun and just relax or to eat and laugh together with your friends and family, it makes memorable moments and happy people. Adults and kids both will enjoy the new addition! Adding on a new deck can ensure that you help create those memories for your family, friends and neighbors for years to come. If you like to entertain, then a deck can offer you a space to welcome guests and enjoy the outdoors. Whether you prefer a large or smaller one, adding a deck to your home really offers a stylish way to enhance your outdoor living space. With the right design, it can bring out the architectural appeal of your home, or even add its own unique qualities to your property. If built properly with the right foundation, you could even add a hot tub for outdoor use! Whatever the reason is that makes you want to add a deck to your home, make sure it is done right so that you can begin enjoying it without worrying about any loose boards or a faulty foundation. Make hiring a licensed handyman on the top of your list. They should be familiar with design, have referrals and can show you examples of their work that will help you be able to create the deck of your dreams. They will know exactly what deck materials to use, everything from the wood to the right screws!